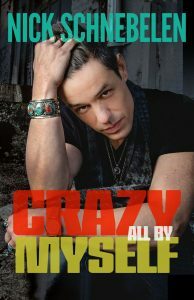 Pre-order “Crazy All by Myself” now! And get the song – Lil Death – today! Great new video, July 31, 2018, Stiefil Theater, Salina KS, shot by Tonight on Crew. Look for more dates on the calendar. Thank you George Thorogood, Destroyers and Tonight on Crew! Nick Schnebelen calls in to the Dusty Banks to discuss his his new trio and tour as well as his past work in the internationally renowned band Trampled Under Foot. He’ll even give some details on his upcoming album Crazy All By Myself slated for release in March 2019. All that plus plenty of incredible music in this segment from Dry River Blues! Listen to the entire conversation here! Check out the July issue of Blues Music Magazine here! Read the Full Interview of Nick Schnebelen. Amy Davidson – Ocala Star-Banner, Ocala, Florida. Nick Schnebelen’s bloodline runs rich with music. His parents played the Kansas City, Missouri, scene in the ’60s and ’70s. His great-grandmother played guitar, his great-grandfather played mandolin and even their parents played violin back in Europe. In 2000, Schnebelen and his siblings formed trio Trampled Under Foot (a nod to the Led Zeppelin song). They gathered awards and accolades, reached top 10 charts and, despite disbanding in 2015, still have quite a fan base. 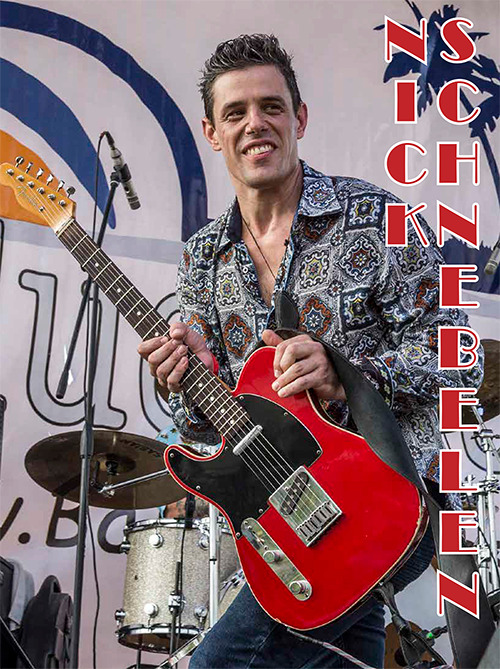 Schnebelen is now recording and touring with his own blues band. In February 2019, he plans to release the album “Crazy All By Myself.” His collaborations demonstrate his longevity and talent as a blues-rock musician. On Friday night, he’ll slide onto the stage to headline the free Levitt AMP concert series at Webb Field in west Ocala. Schnebelen spoke about his music and his influences by phone last week. Question: What’s your sound and style? Answer. My style is playing a lot of styles of blues. There’s a lot of modern blues and a lot of throwback blues. I cover a lot of different styles of blues with a lot of my different guitars. I play a lot of electric guitar, but I also play dobro and slide. Basically, it’s different sides to myself. When: Music starts at 6 p.m. Friday with the Honey Hounds. Nick Schebelen is scheduled to start at 7:30 p.m.
Where: Webb Field, 1501 W. Silver Springs Blvd., Ocala. What else: Non-profit spotlight on Fort King National Historic Landmark. Levitt AMP Ocala Music series is a partnership between the city of the Ocala, Marion Cultural Alliance and the Levitt Foundation. For more information, go to concerts.levittamp.org/ocala. Q. What was the music scene in your home as a kid and how did that influence you? A. My parents were musicians. When we were young, my parents would always have rehearsals at our house or there was always music around us at all times. We got to go out and see a lot of the musicians in Kansas City that were the old blues guys. I picked up a lot of their vibe. That’s how it all started. I started playing music at a young age, and we come from a long line of musicians. I had a chance to grow up around some fabulous musicians, so I like to think that I got a well-rounded education. Q. Who were some of your favorites that influenced you directly? A. Albert King, Freddie King and B.B. King are my three tops. Q. You’ve played with your brother and sister in Trampled Under Foot. How is it different with your own band now? A. It’s a different sound. It’s more my side of what Trampled Under Foot was. I think the music is a little more intense now than before. There’s a lot chops-a-flyin’. Q. There’s a lot of what? A. [Laughing] It’s a Louis Armstrong term. Chops-a-flying. There’s a lot of music and killer players. We jam out a lot, and we’re not too strict on our songs. Q. What do you feel when you’re playing live, and how do you think this resonates with the audience? A. When I’m playing live, I’m giving it my all — pushing really hard with my guitar — and I think people really appreciate the intensity. I love playing for people and touring and just putting on a good show.